When it comes to planning dinners for regular weekdays, its almost always some subji with roti, if not the upmas or other one pot meals. Getting Hubby dear eat pastas will be out of question. Or else those Parsley Pesto Fusilli Pasta or Gnocchi in Creamy Tomato Sauce will make such delicious meals. Then it comes the regular question on what new subji we can make, other than repeating ourselves. Folks at home have given up and accepted that if a new dish needs to be done, it should be verified first if its already featured or not. There are also some comical situations when I would’ve clicked some dishes, yet to share. And they will remember that I have clicked. I will say I haven’t done it. In my understanding it would mean I am yet to share, however they will assume that its posted. So I will then have to explain, if clicked is shared, then its done, else its not done! I am sure my BM Buddies would agree to this case happening all the time with them. Coming to the post of the day, we are doing second week of BM#55 and I will be sharing some Healthy Dinner meals. 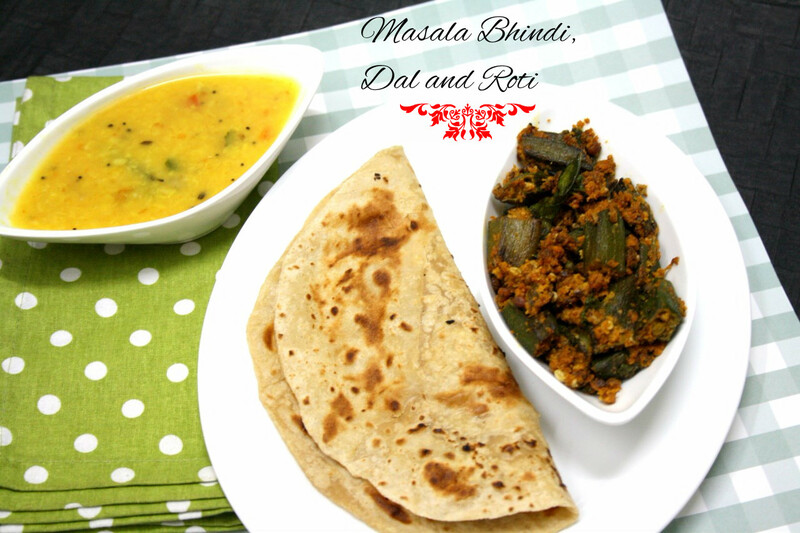 For day 1 it was Khichidi and on the same lines, I have a Masala Bhindi, with Masala Dal and roti. The Masala Bhindi was the dish to be tried, since we were skeptical if Hubby dear will eat a dry dish with roti, we decided to make a dal and it naturally has to be spicy. So I decided I might as well make a new version. However many versions of Dal you have, its still not enough! It was a hearty meal, while the most common as per my North Indian friends is always a Dal Chawal and Bhindi, I would say this fits the bill quite perfectly too! 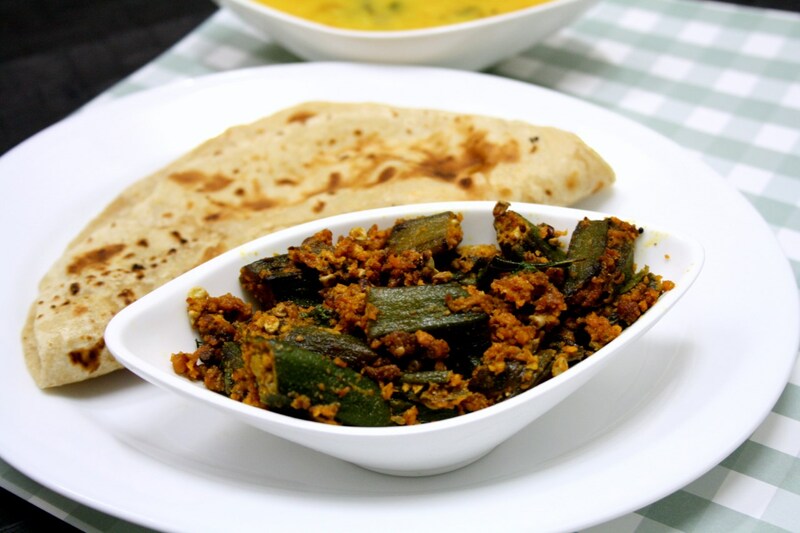 During our initial marriage days, Hubby dear use to talk so much about Bhindi masala, that I was so obsessed at trying different dishes that went by the name. So you can see couple of different Bhindi Masala going around. So this one joins the list as well! Wash and pressure cook Moong dal for 2 whistles. Heat a pan with oil, temper with mustard seeds, cumin seeds, slit green chilies, saute well. Then add hing, garlic, onions, saute for few mins. Next add chopped tomatoes, and all spice powders expect amchoor and garam masala. Add the boiled dal and enough water to get a thick dal. Bring to boil. After the boil, add the amchoor and garam masala. Adjuct salt and finally add chopped coriander leaves. Dry roast all the ingredients listed under powder, cool and grind to a fine powder. Keep it aside. wash and wipe the bhindi, cut into 1 inch pieces. Allow to dry for 10 mins. Then heat a kadai with oil, temper with cumin seeds, then add the Bhindis, saute well. Now add salt, turmeric, grated coconut, red chili powder and fry. After 3 -4 mins, add the ground powder, combine well. I totally agree with you about the sharing the recipe! In my case, I click the food before everyone is back, so they won't know whether the camera has appraised it or not ;-). I too go for a dal as well, when making a dry subzi for rotis :D.
What a hearty and delicious dinner you got there Valli. Both the masala bhindi and dal sound yumm!! Many people do not like bhindi, but its one of my fav veggi. Masala bhindi looks great. The bhindi recipe is interesting , like the sesame peanuts going into It. Tha daal is a perfect combo with it . Such a delicious dinner. I could never make my hubby eat dry sabzis and rotis. There needs to be a gravy, so just stopped making them. I am tempted to make this at least for myself. 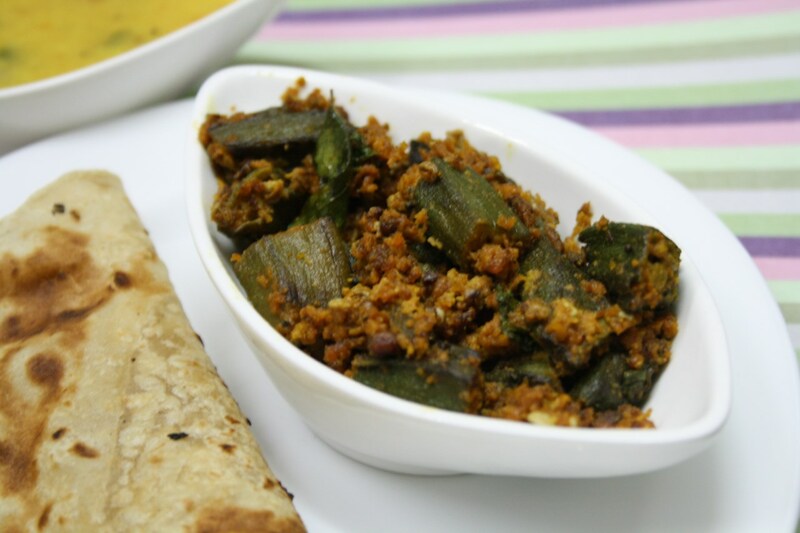 Masala bhindi looks so comforting and delicious. A perfect meal platter. Bhindi masala looks tempting .. Perfect combo with dal and roti. I have also been trying various versions of bhindi masala even though even one hasn't been stamped approved by the husband. Your recipe looks delicious. Gonna try this asap! Hi, I just wanted to tell you that I tried this recipe and finally got approved by the husband….so thanks a bunch for this! !